The Gillette MACH3 Turbo Razor features sharper blades and delivers a closer shave without all the irritation. The Turbo Cutting Blades cuts hair more easily for superior comfort with less tug and pull. 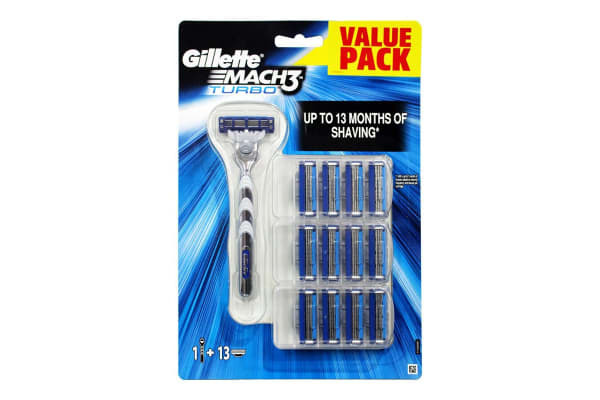 The Gillette MACH3 Turbo Razor features a long-lasting Comfort Gel Bar that glides across your skin with comfort. This razor includes 2x more Skin Guard fins for a smooth shave. The responsive blade suspension keeps the blades in close contact with your skin and the pressure-adjusting pivot adapts to contours for a comfortable, easier shave. It still feels better after 10 shaves than a disposable does on its first.